DRAW ON! 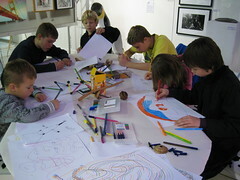 Celebrate drawing with two weeks of drawing-inspired activities in Tamworth from March 24 through April 7. The Arts Council of Tamworth, in collaboration with the Cook Memorial Library, the Chocorua Public Library, The Other Store, The Remick Museum, the Tamworth Lyceum, and the Samuel Wentworth Library, invites you to celebrate drawing all around town from Saturday, March 24 through Saturday, April 7. Draw On! is a community festival introduced by The Aldrich Contemporary Art Museum in Ridgefield, CT in 2006 to bring together people of all ages through the simple act of drawing. Innovative workshops and special events encourage participants to express themselves in new and imaginative ways. Last year Draw On! welcomed more than 11,500 people from all over the Northeast. They attended drawing-related events in local libraries, schools, museums, senior centers, art guilds, local businesses, nature centers, historical societies, and recreation centers. This year attendance is expected to reach 13,000, with participating organizations to date in over 8 states. Ongoing drawing opportunities for all ages will be available in Tamworth during the two weeks of Draw On! Visit the Cook Library to draw Art Cards for trading (thanks to Louise Wrobleski for instructions and inspiration), the Chocorua Library to draw images from books, The Other Store to draw, doodle and design at the tables, and the Tamworth Lyceum to add to the giant communal wall drawing. Drawing materials will be available at all locations, or bring your own! Area residents will also have a number of opportunities to work with teachers on various drawing techniques. On Saturday, March 24, from 11 AM to 3 PM, during the Remick Museum’s Maple Sugaring Day*, artist and museum educator Kathy Johnson will lead a group drawing of the Remick Farm and maple sugaring events. (*The fee for Maple Sugaring Day is $5 for non-members, with $2 off if you bundle a meal with admission.) On Tuesday, March 27, from 4:00 to 5:00 PM at the Cook Library, create individual and group drawings with artist Chris Clyne. On Saturday, March 31 from 3 to 5 PM the Tamworth Lyceum will host a class with artist Jamie Oakes on the traditional drawing technique Chiaroscuro (which means ‘light-dark’ in Italian). Famed artist such as Leonardo da Vinci and Caravaggio used this technique to create rich field of depth between the background and foreground. RSVP to jamie@tamworthgarden.com so that we will have sufficient supplies on hand. On Wednesday, April 4, from 4:00 to 5:00 PM, artist Jay Rancourt will lead a paste paper drawing and collage greeting card workshop for all ages. 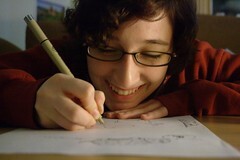 And in Sandwich, on Friday, March 30, drawing materials will be available to patrons of the Wentworth Library all day. All events other than Maple Sugaring Day are free; donations to the libraries are always welcome. For more information, please visit artstamworth.org, call 603-323-8104, or visit the Draw On! website. where you can scribble all over the webpage in many colors of “ink”. If you’re not able to attend an event, you can also send a drawing in digital form for us to post on the local arts website, Art Connects Us. Draw On! is sponsored, in part, by The Aldrich Contemporary Art Museum in Ridgefield, CT. Please visit the website (drawon.org) for a complete list of sponsors.